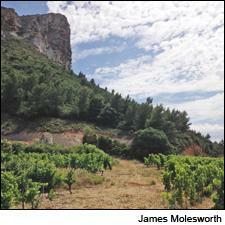 The imposing Cap Canaille stands guard over Clos Ste.-Magdeleine's vineyards and the bucolic fishing town of Cassis. I finished up my Rhône and Provence trip with a stop in Cassis, the charming seaside town that lends its name to the small appellation known for stylish, minerally whites and rosés. In summer, the town swells from around 8,000 inhabitants to 40,000, all despite the fact that there isn't a decent-size hotel in the area. Even after a rebound in plantings over the past generation, there are only 530 acres of vineyards and a handful of producers in the Cassis AOC. The most prominent producer here is arguably Clos Ste.-Magdeleine, owned by the Sack family. Jonathan, 37, along with his wife, Aurelie, are the newest generation to head the estate. In 2009, Jonathan left real-estate law and returned to take over the estate from his parents. "There wasn't pressure to return," said Jonathan. "Instead there were little voices in my head telling me it was a good idea." The estate, purchased by Jonathan's grandfather in 1921, totals 30 acres of vines producing 5,000 cases annually, split between 75 percent white and the rest rosé. These vines enjoy a spectacular setting, with a 5-acre parcel sitting on a peninsula that juts out into the Mediterranean as well as 20 acres on a north-facing, pure limestone terrace just a 5-minute drive up above the town. With the impressive Cap Canaille cliff standing as a back drop and an eye-popping canary-colored art deco house that sits in the middle of the property, Clos Ste.-Magdeleine vies for the prettiest vineyard I've ever seen. Luckily the quality of the wines matches the setting—both the white and rosé sport a breezy profile, with brisk edges and pure, chiseled flavors. "It's a windy area and so close to the water, so the wines have that sense of iodine blown in from the sea," said Jonathan. Both white and rosé are fermented in stainless steel. The white doesn't go through malolactic fermentation often, though if it does kick in, Jonathan will let it go. The 2012 Cassis (40 percent Marsanne with Ugni Blanc, Clairette and Bourboulenc) has a brisk peach pit, lemon zest, verbena and wet stone profile. The 2013 Cassis did go through malo and it shows a richer, rounder edge than usual as a result. It keeps its stony core though, along with melon rind, verbena and green and yellow apple fruit flavors. The 2013 Cassis Bel-Arme is a new cuvée (it debuted in the 2012 vintage) made from 60/15/15/5/5 Marsanne, Ugni Blanc, Clairette, Bourboulenc and Pascal Blanc, fermented with indigenous yeasts in cement eggs and kept on its lees for six months prior to bottling. It's fuller in feel, with bright tarragon and crème fraîche notes, along with peach pit, lime zest, meringue and lemon chiffon hints. The 2013 Cassis Rosé is made entirely from direct press. The 40/40/20 blend of Grenache, Cinsault and Mourvèdre—much less Mourvèdre than the typical Bandol rosé, for comparison—is lighter in feel, but no less lengthy than a top Bandol rosé, with high-pitched cherry pit, wet stone and rose water notes and a pure fleur de sel hint on the finish. As with most rosés from neighboring Bandol, just a year of age will help it stretch out and gain a little more complexity, though I suspect the vast majority of it is drunk as soon as anyone gets their hands on it.